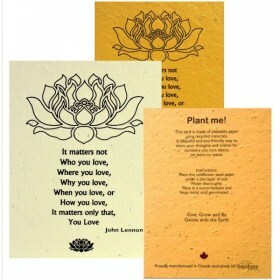 Love - John Lennon - Plantable Card Assorted colours. These cards are made from recycled materials and are designed and made in Canada. A beautiful Eco-friendly way to share your thought and wishes for someone you care about, yet leave no waste behind. Comes with envelope in protective sleeve.